Producing masses of huge, conical-shaped blooms from June until October, with some clusters reaching over 30 cm (12') across. 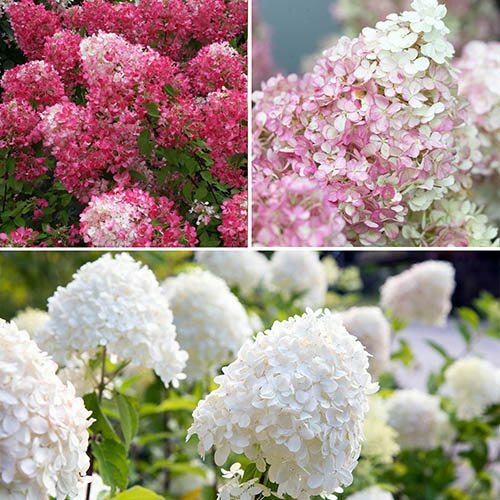 These will fill your summer beds and borders, as well as patio pots with wonderful colour. This collection includes 1 strong Bare Root bush of Diamant Rouge, Limelight and Sunday Fraise. Producing masses of huge, conical-shaped blooms from June until October, with some clusters reaching over 30 cm (12') across, these will fill your summer beds and borders, as well as patio pots with wonderful colour. The collection covers the widest colour range and each is very easy to grow. Totally winter hardy and guaranteed to thrive anywhere in The UK! Great cut flowers too! Height 90 cm (3ft).